Souella joined the Zonta Club of Wellington in October 2006 and quickly became an engaged and active member, generously offering the Club the use of the KPMG offices for Club and committee meetings. Finance committee as a member 2010-2012 then becoming Chair 2012-2014. 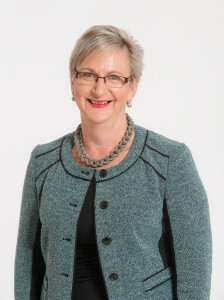 Souella is an independent director of the Order of St John in New Zealand and has recently been appointed to the newly established role of deputy Chancellor. She also chairs the St John Risk and Audit committee. Souella is a partner in KPMG New Zealand based in Wellington and leads KPMG New Zealand’s Government Advisory Services. She has over 25 years experience in providing risk management, internal audit, project advisory and governance services to a range of public and private sector clients in New Zealand and overseas. She works extensively with Audit and Risk Committees providing good practice advice, and assurance to Committees on risk management and internal audit activity. Souella’s risk management experience includes providing risk management services to the 2011 Rugby World Cup and the 2015 Cricket World Cup and Under 20 FIFA World Cup. Prior to her involvement in the provision of internal audit and assurance services Souella’s background included providing external audit services to clients in the finance, retail, service and manufacturing industries. More recently Souella has been involved in working with not-for-profit and government and non-government organisations and she has experience of assessing governance structures and working with board and audit committees to implement best practice. Souella is committed to making a real difference in the lives of women and girls through Zonta and demonstrates this within her professional and Zonta roles. She has been elected as the Lt Governor for the 2016 – 18 biennium.